Fairlop. 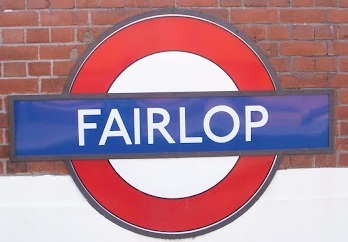 A legend surrounds the name of Fairlop. In the early part of the 19th century there was a fine oak tree here, which sheltered a long-established fair founded by a certain Daniel Day. When Day died in 1767 his friends, after much consideration, decided to make his coffin from the tree and as the tree continued to flourish, they agreed that they had made a fair lop. A little fanciful perhaps, but the name is derived from fair and the Modern English lop 'a small branch or twig' - and means 'the beautiful trees with their leafy branches' which stood nearby. The station was opened as Fairlop by the Great Eastern Railway on 1 May 1903 and first used by Underground trains on 31 May 1948.